The village of Kinlough lies between the beautiful Darty Mountains and the Atlantic Ocean. There are many amenities in the village such as pubs, shops, restaurants, a takeaway and folk museum! Nearby Lough Melvin provides superb fishing opportunities and is a natural haven that wildlife enthusiasts will enjoy. 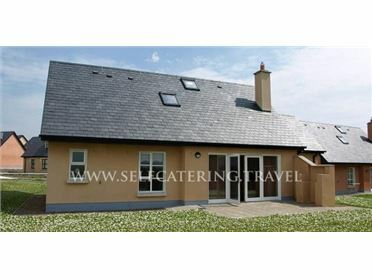 A wonderful base for enjoying Leitrim, Donegal and Sligo. Oil underfloor heating in living area, radiators in bedrooms, solid fuel stove. Electric oven and gas hob, microwave, fridge, washing machine, dishwasher, TV with FreeSat, DVD, selection of books, games and DVDs. Fuel, power and starter pack for fire inc. in rent. Bed linen and towels inc. in rent. Travel cot and highchair on request. Off road parking for 3 cars. Patio and covered veranda with furniture and BBQ. Enclosed gravelled area. Sorry, no pets and no smoking. Note: There is a mezzanine sitting area, a small stream to the side of the property and the cottage is close to the road so children must be supervised. Note: The bunk beds are suitable for children up to 14 years of age. Note: There is a step into one of the double bedrooms. Note: Fishing is available on the nearby lake, please contact the owner for further information..